Technology: General Stamping uses punches, dies, and other techniques to create three-dimensional parts and add surface definition such as lettering to flat-sheet materials. Stamping services can process ferrous and non-ferrous metals, exotic metals and alloys, precious metals, and thermoplastic materials. General stamping differs from deep drawing in that the finished parts are relatively shallow compared with their diameters. General stamping operations includes single operation forming, where the piece is formed in a single press stroke, or where the piece is formed through several independent dies and press stations. It also include progressive die stamping, where a single die set is used to stamp complex, usually small, parts in a number of sequential operations, but all within the same dieset. Progressive dies keep the part attached to the coil stock until the very last operation where it is removed from the carrier and ejected from the press. Transfer dies do not rely on the coil strip to carry the parts through successive press strikes. 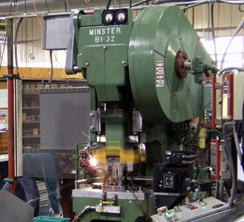 General stamping processes can include drawing, bending, flanging, and hemming. Advantages: An alternative to machining, casting, and roll forming, stamping produces high volume runs with low piece costs. High speed stamping operations can produce parts at rates of hundreds per minute. Applications: General stamping is used to produce all manners of simple and complex parts in sheet metal, from small to large.